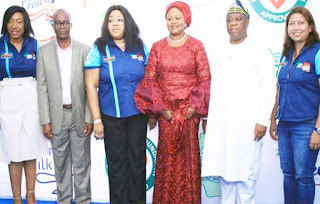 Maureen Ifada, Marketing Manager (Peak milk); Dr. Bartholomew Bari, President Nutrition Society of Nigeria; Mrs. Ore Famurewa, Corporate Affairs Director FrieslandCampina WAMCO Nigeria PLC; Barrister Olayinka Oladunjoye Hon. Commissioner of Commerce, Industry and Cooperatives Lagos State. Dr. Samuel Adejare, Hon. Commissioner for Water Infrastructure Development; Zatur Hassim, Specilised Nutrition Lead at the occasion recently. Experts have advised Nigerians irrespective of gender and age to ensure that milk is an important part of their diet, saying that it provides essential nutrients to the human body. The call came weekend, during an interactive session organised by FrieslandCampina WAMCO Nigeria Plc, one of the leading dairy nutrition company, makers of Peak milk, Peak 456 and Three crowns milk organised health care practitioners. 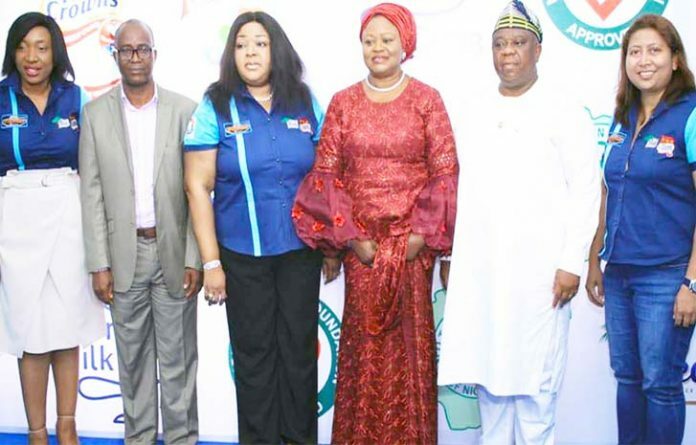 The experts advocated and reemphasised the health benefits of milk and the need to prepare wholesome meals at the event which was held to commemorate the 2018 World Milk Day. Studies show that Phosphorus is needed in the proper ratio to calcium to form bone. Milk provides these two minerals in approximately the same ratio as found in bone. Milk is also a significant source of riboflavin (vitamin B2) which helps promote healthy skin and eyes, as well as vitamins A and D.
Speaking on the importance of milk drinking, Brai Bartholomew, President of Nutrition Society of Nigeria (South) said that strong bones and teeth, growth and tissue repair, red blood cell formation and health, strong immunity are associated with milk consumption. Bartholomew said, “Milk is a complete food that supplies essential nutrients to the human body – carbohydrates, proteins, fats and micronutrients such as calcium, phosphorus, potassium, folic acid, vitamins D, A & B12. “Nigerians, young and old, should therefore include milk in their diets to benefit from its goodness,” added the nutrition expert. However, delivering keynote address, Dr. Rasak Sanusi Associate Professor of Human Nutrition, University of Ibadan, pointed out that the food we eat is related to either promote one’s health or prevent diseases or is even a cause of many of the chronic non-communicable diseases. Earlier in his welcome address, Ben Langat, Managing Director, FrieslandCampina WAMCO Nigeria, said, “Milk is a major source of calcium, a mineral that promotes strong bones, as well as helps fight weight loss. Unfortunately, numerous slimmer evade milk and dairy items since they believe they are fattening. Langat who was represented by Mrs Ore Famurewa, Corporate Affairs Director, FrieslandCampina WAMCO, stated that the occasion provides a wonderful opportunity to highlight the huge essential supplements contained in milk. “To deal with getting the best out of the nutrients that milk offers without being in danger of any sickness is to drink milk every day and incorporate milk in your meals as much as possible,” he said. The event had in attendance about 200 healthcare practitioners including, general practitioners (GP) nutritionists, geriatrics, cardiologists, dieticians and nurses. The World Milk Day was established 18 years ago by the Food and Agricultural Organisation of the United Nations to highlight globally, the essential nutrients in milk.